Designed by Toni Steere and Jenny Foltz of Wing and a Prayer Design, this beautiful quilt features gorgeous batiks from Timeless Treasures. Mystical Prism uses all 20 beautiful batiks from the 2017 Tonga Mystical collection in a palette of deep blue to turquoise with purple accents to create the illusion of a kaleidoscope. 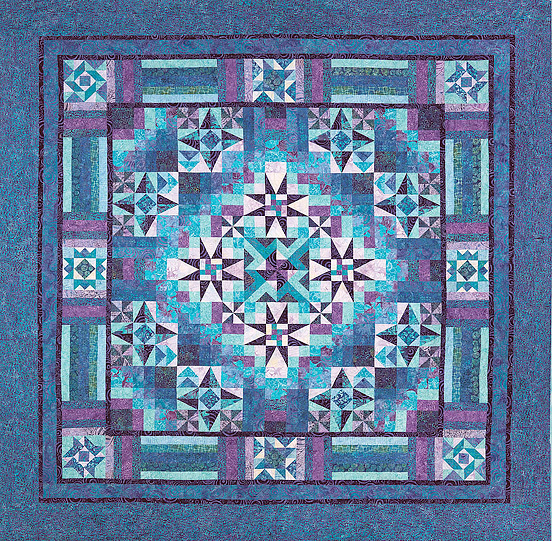 This 102” square quilt uses traditional piecing with unusual fabric color combinations. Points are easily made with optional rulers or the paper template included with the pattern. This program begins on October 15, 2017 and runs for 12 months. It includes your pattern and all the batiks needed to make the quilt top, borders, and binding.